Bomberman is patrolling the area on his Motobomber motorcycle, when he's suddenly ambushed by Black Bomberman and his gang, who rough him up and steal all of his power-up items! Bomberman doesn't take this lying down, and sets out to win back what is rightfully his. 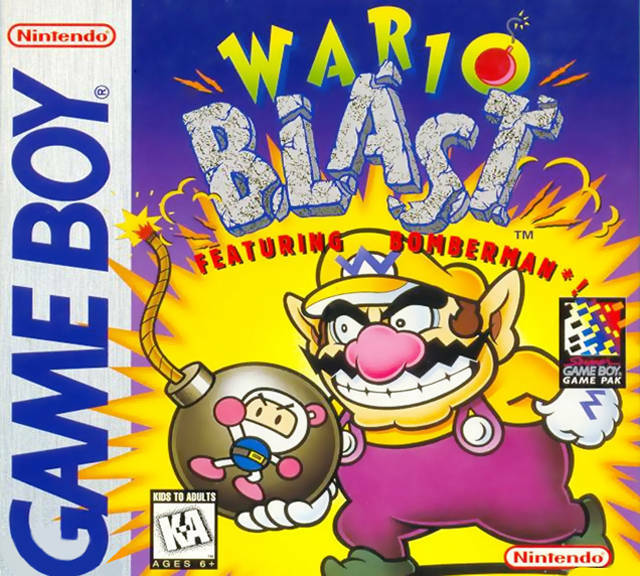 Keen to conquer more lands and claim more treasure, Wario discovers the secret "extra-dimensional" gateway into Bomberland. Believing the residents to be dim-witted thugs, he has plans to make them into his underlings. However, he's shocked to find imself under attack by the Madbombers, who want to chase him out of their world! The second Bomberman game for Game Boy. After doing nothing but blowing up monsters in Bomber Boy, this game goes for a change of pace - now the entire game is spent blowing up other Bombermen! As such, the single-player mode is little more than a Battle Mode against computer-controlled opponents, with the occasional environmental hazard, boss fight or permanent power-up to add a little variety now and then. Nothing spices up a Bomberman battle more than riding a motorcycle at the same time. The game is perhaps best remembered for its English release, which dropped a totally unexpected crossover with Super Mario Land's very own Wario into the game! Check out the regional changes page for that kettle of fish. There's an undeniable intrique to the game entirely due to its totally ridiculous Wario crossover! !, but outside of that, there's not a lot to fall in love with. Gaining abilities as you defeat bosses is a neat little innovation (heck, bosses are a neat little innovation; the game would be a grind without 'em! ), and the stage gimmicks certainly try to make things less monotonous. However, the power-ups quickly turn the game into a cakewalk, and there's very little the enemy combatants can do to stop you. When you're facing off against monsters, the developers can give them any ability they like - invisibility, the ability to pass through walls, and so forth. The challenge comes from overcoming their unique abilities and patterns. When facing off against other Bombermen, it should be a battle of evenly-matched combatants with only power-ups and wits to determine who wins. The parallel falls apart when you can run faster, leap over blocks and pummel the enemy senseless not even halfway through the game, and all they can do is kick bombs... if they remember they can do it, that is. The enemy Bomberman AI is particularly poor, and when the entire game consists of fighting other Bombermen, that's not a good sign. How bad is it? Well, let's say the other games that put the Battle Mode front and centre usually do a better job of preventing the combatants from blowing themselves up before you even see them. Okay, it's an occasional occurance, but there's a lot of exploitable quirks that you feel should've been ironed out if these guys are the brunt of the game's challenge. The boss AI is a little more engaging, if only because they have their own unique abilities, traits, and no bombs to blow themselves up with. Despite the flaws (biased folks might call them "quirks! "), it's not a bad game. I have to commend it for the cute graphics and occasionally catchy music, and it's a very 'lightweight' game. It's simple and easy to pick up, and offers a smidgen of variety and rewards for the player's progress to keep things interesting; something I felt Bomber Boy failed to provide. It ain't a progressive Bomberman game, but if you're looking for a time killer and aren't too fussy, Bomberman GB isn't a terrible choice. 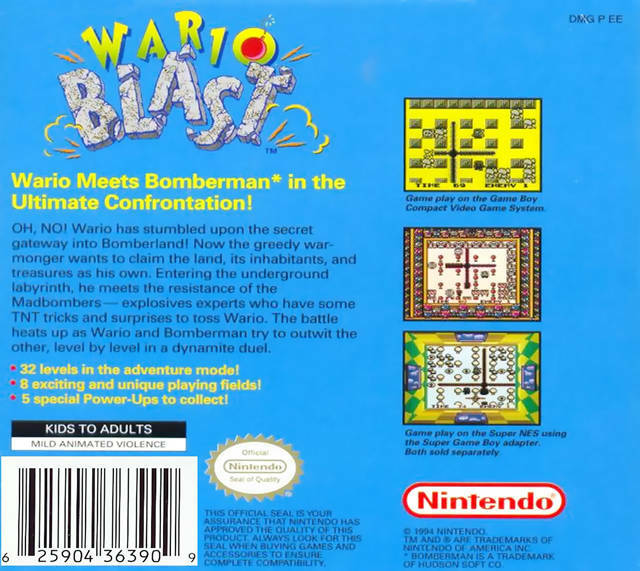 Bomberman GB was later included on the Game Boy compilation Bomberman Collection. Since this game was rebranded on English shores under a different title (see regional changes), Bomberman GB 2 was renamed Bomberman GB in English markets. If you're looking for the one with the fedora-wearing Indy Bomber, then GB 2 is what you're after. Bomberman GB is featured in the Super Bomberman Complete Encyclopedia and Bomberman Maniax guide books.